We’re proud to partner with Texas Athletics to improve your gameday experience. With pickup and dropoff near the stadium (Uber Zone in Lot 40) and the all-new Longhorn City Limits and Bevo Blvd., this will be a Longhorns Football season to remember. Check out the pro tips below to make the most of riding and driving with Uber during Longhorns Football season. Enjoy a dedicated Uber Zone in Lot 40 for pickup and dropoff near Texas Memorial Stadium on the corner of Dean Keeton and Red River. When you’re ready for gameday, enter “Texas Memorial Stadium” or “DKR Stadium” as your destination. This will update your dropoff point to the Uber Zone in Lot 40, which is the best way to get to and from the stadium on Longhorns gameday. 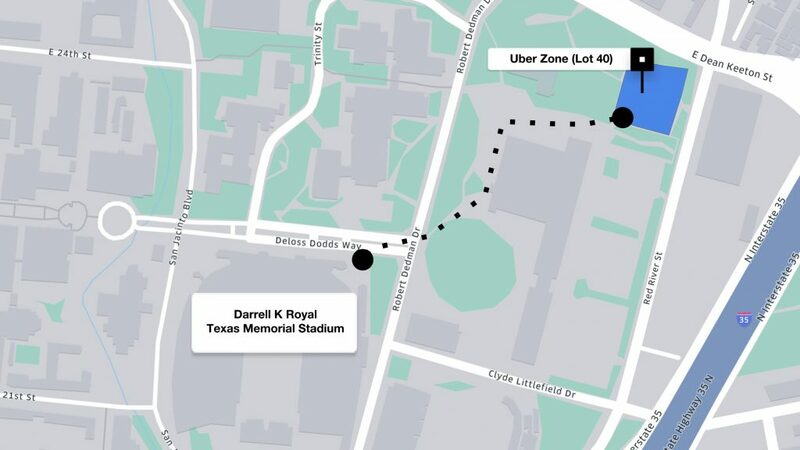 After the game, return to the Uber Zone in Lot 40 (Dean Keeton & Red River) to request a ride. You will still use your app to request a ride as normal. 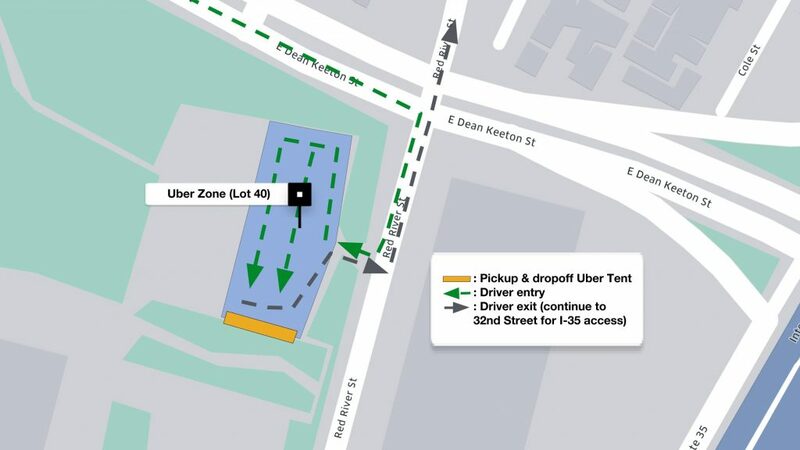 Please note that there will be a $2 event surcharge for all Uber trips leaving from the Uber Zone in Lot 40. This surcharge is retained and used by Uber to help ensure a reliable pick up experience at the game. Enhance your Texas gameday experience with Longhorn Moments. Receive text alerts with offers like pregame field access, seat upgrades, photo ops with Texas traditions, and more. To enhance existing security measures and expedite venue entry at Texas Athletics events on the Forty Acres, a clear bag policy is in effect at Texas Athletics facilities including Darrell K Royal-Texas Memorial Stadium. All bags must be clear plastic and must not exceed 12” x 6” x 12” in size. Approved bags include: Bags that are clear plastic and do not exceed 12″ x 6″ x 12″. One-gallon clear resealable plastic storage bags. Small clutch bags or purses do not have to be clear but cannot exceed 4.5″ x 6.5″. Prohibited bags include: Purses larger than 4.5” x 6.5”, diaper bags (Items normally carried in a diaper bag must be put into a clear plastic bag for venue entry), cases (camera, binocular, etc. ), backpacks, fanny packs, printed pattern plastic bags, reusable grocery totes, mesh or straw bags, duffle bags, large totes. Texas Athletics does not provide stadium storage for bags. Get your music fix before the game at the all-new Longhorn City Limits. Located on the LBJ Lawn, situated on the northeast corner of Darrell K Royal-Texas Memorial Stadium, the Longhorn City Limits stage celebrates Austin as the Live Music Capital of the World and features a variety of local and national acts. Admission is free and open to the public for the new gameday concert series that will also feature happy hour specials. For a complete list of acts and Longhorn City Limits updates, follow @TexasLonghorns on social media. This season, the west exterior of Darrell K Royal-Texas Memorial Stadium takes on a new feel as San Jacinto Blvd. from 20th St. to the Etter-Harbin Alumni Center is completely transformed into Bevo Blvd., an action-filled pregame street party. Named after Texas’ iconic mascot, Bevo Blvd. opens five hours prior to kickoff on gamedays* with Texas-sized fun for Longhorns fans of all ages. Bevo Blvd. is free for all fans. No game ticket is required! All activities and timeline subject to change. *Bevo Blvd. closes 30 minutes prior to kickoff to allow fans with game tickets time to enter the stadium to see the Longhorn Band’s pregame performance. We’re partnering with Longhorns Athletics to improve your gameday driving experience. Through our partnership, we hope to connect you with more riders and take out the stress by coordinating a pickup and dropoff zone to meet your rider. Located on the corner of Dean Keeton and Red River, Lot 40 will be the best location to get in and out of the gameday area quickly. Riders will be directed through their app to meet you here and traffic officials will be onsite to help traffic flow. After the game, please turn left onto Red River when exiting Lot 40. For direct access to I-35 North/South, continue north on Red River to 32nd Street, rather than turning directly onto Dean Keeton. Please be respectful to all on-the-ground officials and follow directions from law enforcement, as instructions and map may be subject to change. Thanks for riding and driving with Uber, we’re proud to support the Texas Longhorns. Hook ’em, Horns!